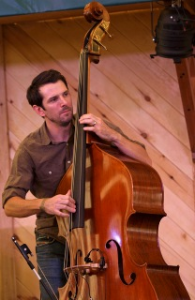 Double-bassist Corey DiMario is one of the most sought after accompanists in the acoustic music scene. He has performed at major festivals and concert venues across North America, Europe and Australia. A diverse musician, Mr. DiMario adds rock solid, low-end accompaniment and driving rhythm to any musical situation. A founding member of the string band sensation Crooked Still, DiMario brings a diverse musical palette and energetic approach to an ensemble. He has also performed extensively with New England fiddler and singer Lissa Schneckenburger as well as being a part of the Brittany Haas/Dan Trueman Band, performing original music in Old-Time and Scandinavian styles. Most recently, Mr. DiMario was in the”house band” for Bela Fleck’s New York Banjo Summit featuring banjoists Tony Trischka, Bill Keith, Pete Wernick, Eric Weissberg, Richie Stearns, Noam Pikelny and of course Bela Fleck. Corey DiMario received his undergraduate degree in Jazz Performance from the New England Conservatory in 2001 and is a free lance musician in Brattleboro, VT. He previously studied at the Eastman School of Music in Rochester, New York. He has studied privately with John Lockwood, Cecil McBee, Paul Bley, John Abercrombie and James Van Demark.